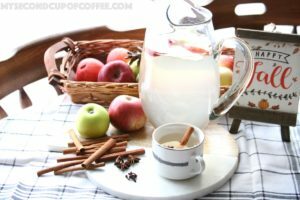 Huh, what’s “apple kompot”, you might be wondering? Not to be confused with “compote”, which sounds just like the Russian drink and is more of a dessert-like fruit spread or jam. Kompot is a popular Russian drink made also from fruit or berries that can be served warm or chilled. But it is most definitely a DRINK, not a dessert. What comes to mind when you think of a Mother’s Day meal? To me, all my mom’s famous dishes immediately pop into my head as a reminder of her love for cooking and baking. Borsch, Apple Pie, Lemon Pie, Jams…Mmmm. But one dish stands out above the rest. It’s what my mom is known for, and it’s what I think of first when I think of my Mama. It’s my Mom’s Infamous Crepes. She makes them plain, stuffed with berries, stuffed with farmer’s cottage cheese, and stuffed with meat. All of the variations she makes are absolutely delicious. The good news is, crepes are not that hard to make! Once you get the hang of it, possibilities of serving them are aplenty. 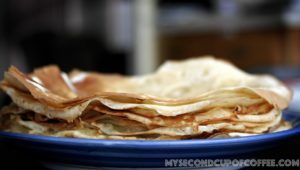 Today I’ll share with you my Crepes Recipe that you can make for your mom (or with your Mom) as well.